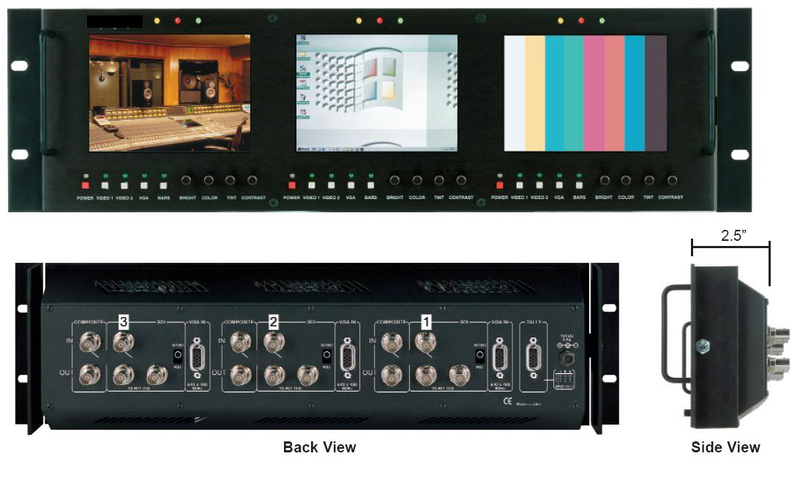 The LCDR3U5-01-SDI is a rack mountable unit that has three independently controlled 5" active matrix LCD panels with active loop through feature. These 5" panels have 960 x 234 pixels producing a true high resolution image. Each monitor has a composite video, SDI, and a VGA input. Each of the three screens also has a built-in color bar generator, individual front mounted selector buttons with LED indicators and color, tint, brightness and contrast controls. The unit fits into a EIA standard 19" rack, 3U high. In addition to the digital and analog loop through features, this unit also has a 10-bit converted output from the digital input. The unit includes power supply and dry erase marker and is available in either NTSC or PAL format.